Oh how I have missed you, Agent Pendergast. 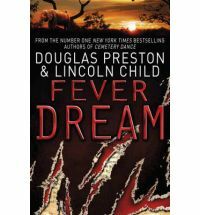 In his latest adventure, Fever Dream by Douglas Preston & Lincoln Child, Aloysius Pendergast, that dapper, genius of a federal agent with 2 PhDs and a vast fortune, reminiscent of Sayers’ Lord Peter Wimsey, must delve into his painful past to capture a ruthless killer. 12 years ago on a hunting trip, Helen Esterhazy Pendergast was savagely killed by a lion in Zambia and her husband has mourned her loss and joined the FBI. Believing it to have been a tragic accident, Pendergast stumbles upon something which shows it may have been orchestrated. Together with his friend Lieutenant Vincent d’Agosta of the NYPD, they go on a wild goose chase into Pendergast’s past to find out what exactly happened and who Helen really was. What was she up to before she died? And did Pendergast really know his wife of 2 years, one of the few people in his complicated and tragic life who he implicitly trusted? As with Preston & Child’s previous novels in the series, I strongly recommend you start reading the earlier novels, either Relic, the first in the series, or the one I started with, The Cabinet of Curiosities. Although most are standalone books (except for some of the later novels which form the Diogenes Trilogy), they follow a loose timeline and I feel it’s better to get to know the characters which will make the reading experience more comfortable. If you’ve read most of the novels, I’m sure I don’t have to urge you to pick this one up as it should already be in your hands. As you can probably tell, I’m a HUGE fan of Agent Pendergast. The books are thrilling, fast-paced, packed with nuggets of historical detail and boasts some truly terrifying baddies. In the previous novel Cemetary Dance, I learnt a lot about voodoo. In Fever Dream, it’s all about John James Audubon, the celebrated painter of birds (and author of the most expensive book in history). Pendergast, whose wealthy family owns a rare edition of an Audubon folio, discovers that before her death, Helen had been secretly hunting for an early Audubon painting, the Black Frame, which has been missing since Audubon left the sanitorium where he had been recovering from a breakdown. Coupled with a sinister connection to a secretive pharmaceutical company, Pendergast is in turn dreading, yet cannot stop, hunting through his beloved wife’s past. So, need I say more? Can I persuade you to give the Pendergast novels a try? Go on, you know you want to. And you’ll make me very happy if you drop me a line about whether you enjoyed it or not. I, of course, will be waiting with bated breath for the next in the series, Cold Vengeance, out later this year. Thank you for this review, it sounds like a lovely series. I’m putting these books on my wishlist. I’m not much of a mystery fan, but you make the protagonist sound intriguing. I’m pencilling in the authors on my “maybe” TBR list and will interrogate the library catalogue! It will be interesting to see what you think:) I haven’t really come across other reviews of this series and it’s one of my favourites. I read one Agent Pendergrast book and it was just okay. Later, I heard it was probably the weakest in the series. It sounds like I should go back and try early entries of the series.